Dorsey Brodie Hardeman (December 11, 1902 – August 11, 1992) was a Democratic politician, attorney, businessman, farmer, and rancher from the U.S. state of Texas. Hardeman was born in Henderson in Chester County in western Tennessee to educator and Church of Christ clergyman Niicholas Brodie Hardeman and the former Joanna Kendall Tabler. He first studied at Freed-Hardeman University, an institution founded in Henderson in 1908 by his father and A. G. Freed. He attended the University of Florida in Gainesville, Florida, and procured his LLB from Vanderbilt University Law School in Nashville, Tennessee. In 1932, Hardeman came to West Texas to practice law in San Angelo in Tom Green County. In 1936, he was elected mayor of San Angelo and held the municipal position for two years. In 1938, he was elected to the Texas House of Representatives from District 91 and served two two-year terms before he enlisted in the United States Army Air Corps, the forerunner of the United States Air Force. Sent to officers training school, he became a judge advocate general. After his military service, Hardeman was elected in 1946 to the Texas State Senate from District 25, which then included Brewster, Coke, Coleman, Crane, Crockett, Edwards, Glasscock, Irion, Jeff Davis, Pecos, Presidio, Reagan, Runnels, Schleicher, Sterling, Sutton, Terrell, Tom Green, Upton, and Val Verde counties. Hardeman served in the upper legislative chamber for twenty-two years. Hardeman became a powerful, well-known senator because of his knowledge of the lengthy and intricate Texas Constitution, implemented in 1876 and still in use. Through his chairmanship of the Senate State Affairs Committee, Hardeman became a master of legislative procedures. He worked to revise the code of criminal procedure. He pushed for completion of Angelo State University, a four-year state-supported institution in San Angelo. He supported the construction of the Stacy Dam and Reservoir on the Upper Colordao River of Texas. 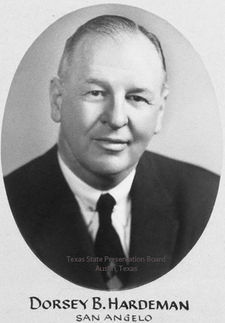 In 1969, Governor Preston Smith, a fellow Democrat, named Hardeman the executive director of the Texas Water Commission, a position which he retained for two years. From 1971 to 1982, he was a commissioner of the agency. Hardeman was a descendant of William P. Hardeman and Bailey Hademan, two of the signers in Washington County on March 2, 1836, of the Texas Declaration of Independence. A successful businessman, Hardeman owned the historic San Angelus Hotel in San Angelo and held both ranching and farming interests in Texas and Colorado. He owned a title company. He was a member of the Sons of the American Revolution, Sons of the Republic of Texas, Knights of San Jacinto, Sons of Confederate Veterans, Order of Stars and Bars, the Baronial Order of Magna Carta, the Huguenot Society, and the Knights of Malta. He was an honorary member in the Greek order of St. Denis of Zante. Hardeman was a lifetime member of the Texas State Historical Association. He was also affiliated with the American Legion and the bar associations of Texas and Travis and Tom Green counties. Married to the former Geneva Moore (born 1918) of Brownwood, Texas, Hardeman died in the capital city of Austin at the age of eighty-nine and is interred there at the Texas State Cemetery. ↑ 1.0 1.1 1.2 1.3 Dorsey Brodie Hardeman - Texas Patriot, Soldier, Statesman. therestorationmovement.com. Retrieved on June 4, 2012. ↑ 2.0 2.1 Texas Legislative Reference Library. lrl.state.tx.us. Retrieved on June 4, 2012. ↑ Geneva Moore Hardeman. cemetery.state.tx.us. Retrieved on June 5, 2012. This page was last modified on 26 October 2017, at 11:37.